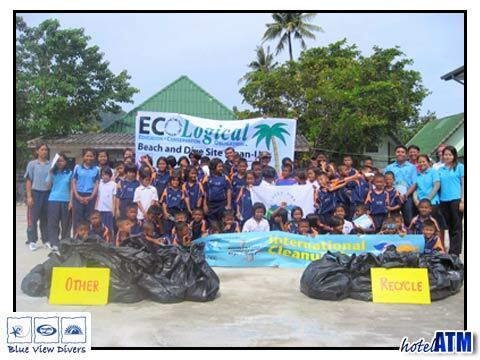 From 19th September- 21st September and with the key backing of Project AWARE, SSI and Greenfins Thailand, Blue View Divers on Phi Phi island, promoted and structured 3 days of organized activities for the International Clean up Day 2008. In all the village, with the help of Blue View Divers, collected just over 645kgs of flotsam from Phi Phi beaches and dive sites. 60 children and 12 staff (including the school principal, Khun Wirawat) of The Phi Phi Island Village School started in the school playground. One of the key aspects of the clean up was to keep a tally of the flotsam and garbage on the beaches of Phi Phi island. The Greenfins Garbage posters, the data collection forms and bin bags were handed out and a talk was given about ICC. After that... Phi Phi Don Beach. In under one hour, the school children had picked up and sorted over 78kgs of rubbish during the Clean up Day 2008 from just in front of the school!!! For this work all the children were handed Certificates of Participation along with a sticker. A great first mornings work done. After lunch 9 of the children went to the class room for further tuition about coral reefs for the IYOR. Following this introduction, the group set out to Phi Phi Ley for some snorkeling where they examined keys aspects of the reef that had just been talked about in the class room; i.e. the many names and shapes of Phi Phi coral, both soft and hard types. The children also learnt more about the importance of algae in the different coloured corals, and also the great variety of marine life living symbiotically in the reefs. The different types of coral damage were also pointed out to the children to increase their awareness of the problems facing the reefs. Sunflower bar on Loh Dalum on Phi Phi Don became the host for a beach clean-up. This day was primarily about getting the village community involved. In getting involved the villagers learnt about responsibility, and the process improved understanding on how long it takes for the garbage and detritus to break down. The negative effect that this has on their island and effect it has on Phi Phi island's tourist industry was also explained. 23 people collected rubbish during the morning session and 35 in the after. These sessions were about an hour each as the famous 35 degrees C of Phi Phi tired everybody. 501 kgs of garbage was picked up and the collection forms categorizing it were duly filled out. Among the notable items were boat rope and parts of disused nets but also cigarette ends, parts of fish traps and cages, and even a boat captain’s seat. The food and beer made for a fun evening and special thanks should also go those who donated prizes from a number of different local businesses. Greenfins ReefWatch (coral monitoring) was conducted on each of these sites. 64.6kgs of garbage was collected, notably clothing, fishing nets, line and cages, rope, beverage cans and bottles etc. 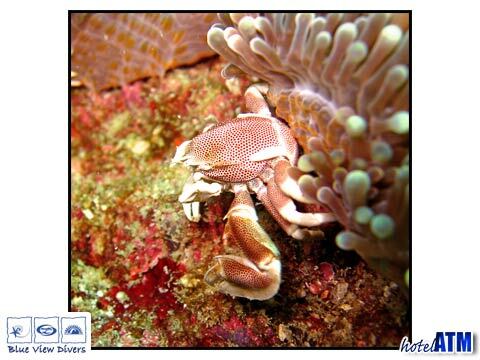 ReefWatch data collected from all 3 sites will help Greenfins and the PMBC (Phuket Marine Biological Center) in terms of monitoring the progress of the health of these reefs over time. Other Blue View Diver Articles "2006 April Diary; Blue View Diving"
"2006 Feb; Blue View Diving"
"2006 Mar; Blue View Diving"
Many thanks to Blue View Divers who gave permission to re write the original article and use the images. Project AWARE Foundation is a nonprofit organization dedicated to conserving underwater environments through education, advocacy and action.